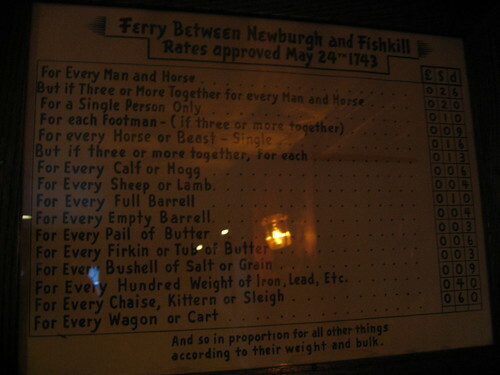 Inside the bar at the Beekman Arms Inn in Rhinebeck, NY, we found this list of ferry rates between Newburgh and Fishkill from May 24, 1743. Notice the stuff that people were bringing aboard with them — horse or beast, calf or hogg [sic], sheep or lamb, pail of butter, bushell [sic] of salt or grain. What an amazing artifact!